I was born in Brazil, but have lived in the U.S. from a young age. This vibrant culture – and love of delicious foods – is an integral part of my life. My energy is infectious, and my story is what led me to where I am today. I have a deep passion for fitness that was born out of my own personal struggles with weight and nutrition. Because I have experienced it myself, I can intimately relate with people who are either out of shape or deconditioned. I was an overweight kid growing up, and was picked on and humiliated throughout my childhood. 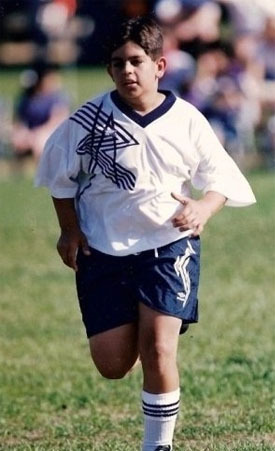 Being a soccer player when I was younger wasn’t enough to keep me from gaining unnecessary weight. I never had the correct eating habits. My friends seemed to be able to eat whatever they wanted, but food affected me differently. By 15, I was extremely overweight and increasingly depressed about the way I looked. I reached a turning point when my Dad gave me a hand-me-down weight training set. It sparked my interest, encouraging me to workout. My body didn’t change overnight. My lifestyle change was still unbalanced as I continued to eat everything I wanted with no nutritional guidance. I ultimately had to reach my breaking point to be fully prepared to make lasting changes in my nutrition and fitness. Over time, I embarked on a journey to learn the ins and outs of fitness and continue to successfully transform my mind, body, and spirit. My energetic personal training style keeps clients motivated while instructing them on proper form, technique, and healthy eating habits. I aspire to transform lives through motivation, education, and accountability. I have been a Certified Personal Trainer & Nutrition Consultant since 2007. My mission is to provide my clients with the education, guidance, resources, and continuous support needed to fulfill their individual fitness and nutrition needs. Have no excuses. You are unstoppable. The day is yours to conquer. Do it proudly. Your life is a culmination of all of your thoughts and desires. Make your dream a reality. If you’re ready to make your fitness goals a reality, contact me to set up a consultation. © Copyright Frank Wall Fitness 2018. All Rights Reserved.